The Eden Raised Garden Bed 4ft x 4ft x 5.5-11in is a great addition to any garden or landscape. The Eden line of raised garden beds in a functional alternative to in ground gardens. This Eden Raised Garden Bed is designed as a 2 tier model allowing for 2 different levels of gardening within the same 4ft x 8ft space. We are able to break the garden into 2 4ft x 4ft sections at different elevations (5.5 inch in height). Constructed from solid fir wood (which is rot resistant), easily assembled with no tools needed, takes an average of a few minutes to assemble. The unique design also includes a center board to prevent the Eden Garden Bed from bowing out or curving in. Standing between 5.5 inch to 11 inch tall, this design allows for deep rooted plants and perennials and is easily expandable by adding another Eden Raised Garden Bed right on top through our unique locking design. The design allows for multiple layers to be added as your garden needs change. Our most popular raised garden bed and it's easy to see why! This 11-inch-high raised garden gives you lots of depth to grow both underground veggies as well as tall plants. With 32 square feet of available planting area this may be all the garden you will ever need, or it's a great garden to gain some experience with before you expand your garden larger or taller. Each modular kit includes thirteen of our 2 inch Classic Sienna composite boards, and twelve 2 inch stacking brackets. The insulating open-channel boards trap air, providing insulation to your soil. Keeps soil warmer in the Spring and Fall, and cooler in the Summer, so you can grow for an extended period. Your two-level garden is also fortified by the inclusion of a 4-Way Bracing Bracket and an additional board to brace your garden against frost push-out and keep it perfectly square. Our Raised Garden Bed Stacking Brackets pivot 270 degrees, allowing endless design options. Create a customizable, animal-proof protection zone for your fruits and vegetables. Our Stack & Extend Animal Barrier has a 5-year warranty. The gated stainless-steel frame and heavy-duty rigid plastic mesh is built to last and won't flop, rust or rot like traditional deer fencing. Easy-access gate makes it simple to tend to your garden with no leaning or reaching. Our sturdy design and premium materials will allow you to protect your garden while maintaining your curb appeal. Connects directly to any Frame It All raised bed system. Since the barrier is raised you will have no issues mowing or weeding around the barrier, (as you would with regular netting or fencing). 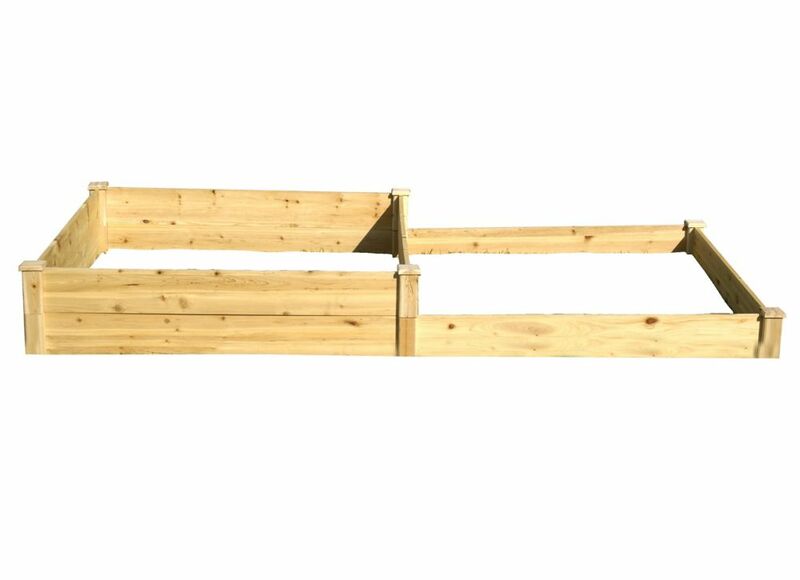 Quick Assembly Raised Garden Bed (4 ft. X 8 ft. X 5-11 inch) The Eden Raised Garden Bed 4ft x 4ft x 5.5-11in is a great addition to any garden or landscape. The Eden line of raised garden beds in a functional alternative to in ground gardens. This Eden Raised Garden Bed is designed as a 2 tier model allowing for 2 different levels of gardening within the same 4ft x 8ft space. We are able to break the garden into 2 4ft x 4ft sections at different elevations (5.5 inch in height). Constructed from solid fir wood (which is rot resistant), easily assembled with no tools needed, takes an average of a few minutes to assemble. The unique design also includes a center board to prevent the Eden Garden Bed from bowing out or curving in. Standing between 5.5 inch to 11 inch tall, this design allows for deep rooted plants and perennials and is easily expandable by adding another Eden Raised Garden Bed right on top through our unique locking design. The design allows for multiple layers to be added as your garden needs change.